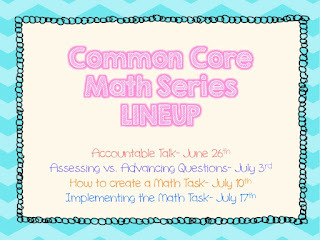 Common Core Math is here to stay for the moment, and I have to say that I am glad that it is! 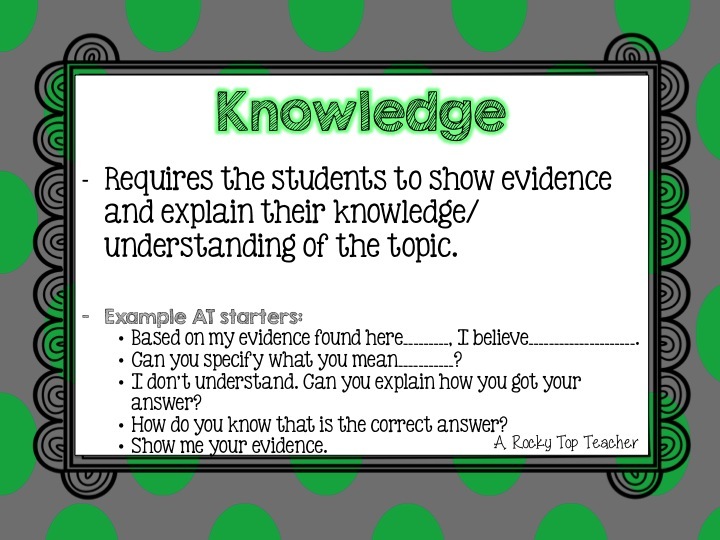 For me, Common Core is about providing the students with a clear understanding of the content that they are learning. It is also about creating rigorous and meaningful learning experiences for EVERY child, no matter their ability level. 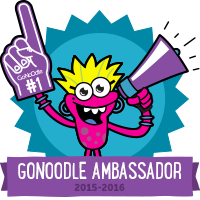 CC gives students the opportunity to be continuous learners who are in charge of their learning experiences. 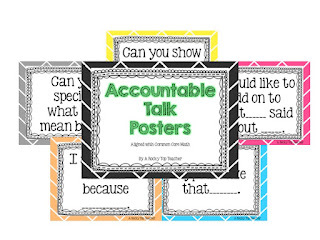 Accountable Talk(AT) is a term used when describing specific and relevant conversation that promotes learning. It is nothing new..in fact it has been around for ages, and that is because it is a vital part of the classroom(and real world) learning journey. And, I believe it! 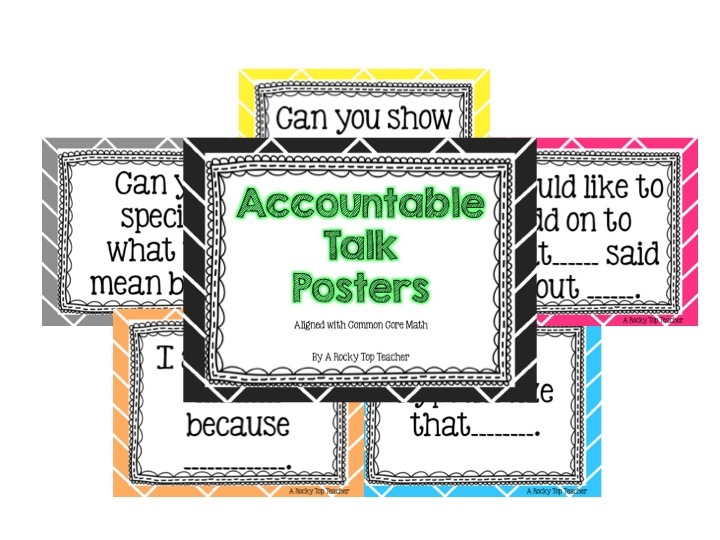 Using accountable talk in your classroom will allow you, as the teacher/facilitator, to engage the students in meaningful conversation, observe their interaction and thinking process, ask and pose questions, and create an environment that feels safe for exploration. I am not going to lie to you. 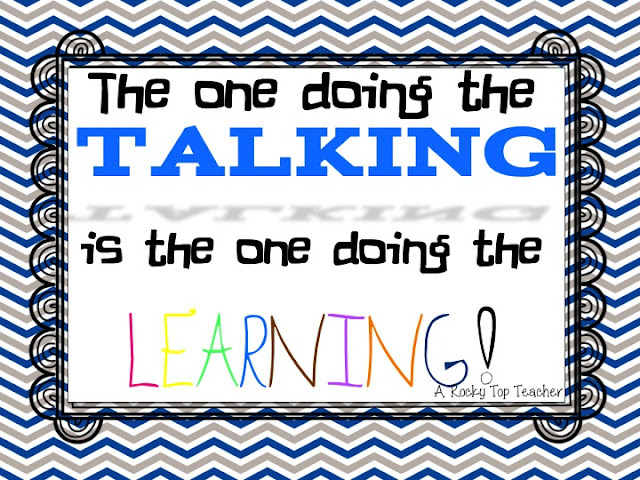 Developing accountable talk use in your classroom takes time, and it is not easy. 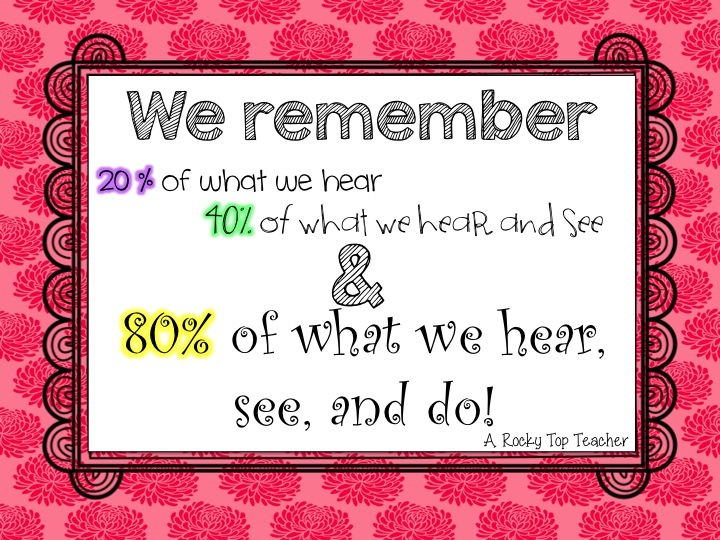 There is a lot of preparation that goes into setting up a classroom environment that can support and encourage the accountable talk procedures. But.....it is so.worth.it! I spent a solid month talking with the students about what the accountable talk sentence starters meant, modeling how to ask and respond to the questions/statements, and hosting "mock" conversations in which the students and I actually wrote out scenarios and reenacted them. It was worth every second. By the second month, the students began to ask the questions and respond on their own. The students were having longer lasting and more meaningful conversations by the third and fourth month, and after that they were using the accountable talk conversations in ALL of our subject areas and often without any prompting from me. In fact, I probably could have walked out of the room and come back and they not even noticed I had left....be still my heart. One of my favorite things about accountable talk is that it can occur in different forms and will look different in every classroom. There are a lot of resources out there via Pinterest, Common Core website, and Google that will direct you to amazing sources of information. Ms. Jones' Junction has some great bookmarks that I used last year in my classroom. Now enough of my rambling and on to info that you can hopefully use! 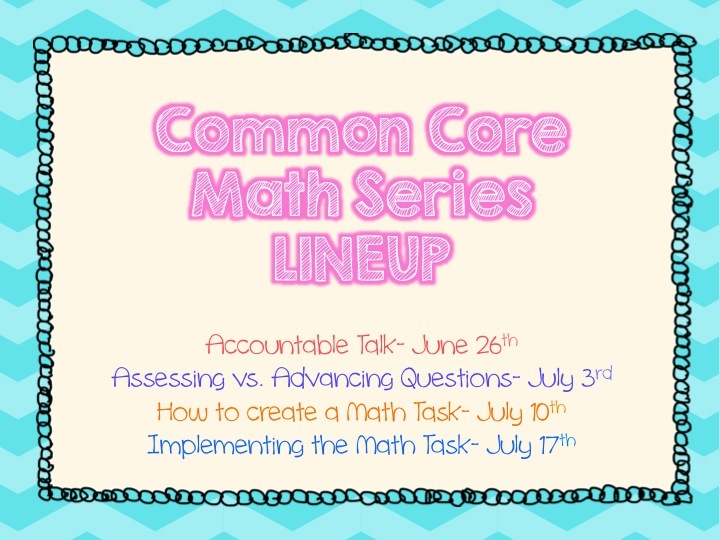 After attending multiple CC math training sessions, I learned about the different stages of accountable talk. 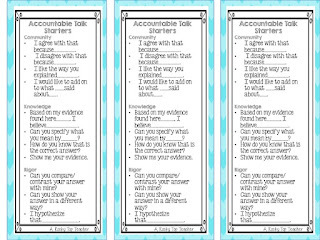 My presenters broke up accountable talk intro three categories. I really appreciate the perspective of AT that the presenters gave me. I never really thought about leveling the questions that were used during our AT discussions, but it totally makes sense! We level the HOT questioning that we ask our students on a normal basis so why would we not level these as well?!? 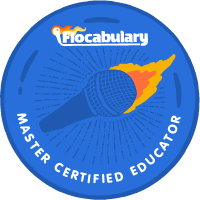 (Teacher learning moment y'all) The students should ask community level questions first to help set a positive and encouraging foundation for the AT session. Then, the students are given the opportunity to explain their solution paths by asking each other knowledge based questions. 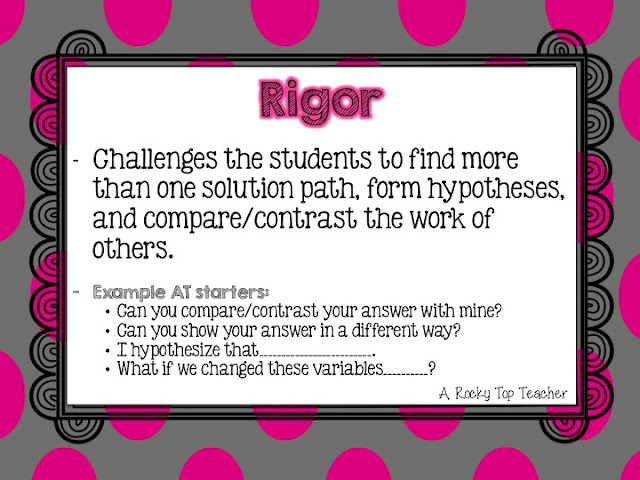 Finally, students can challenge one another by asking rigorous questions that require them to show that they have a true understanding of the standard being addressed. 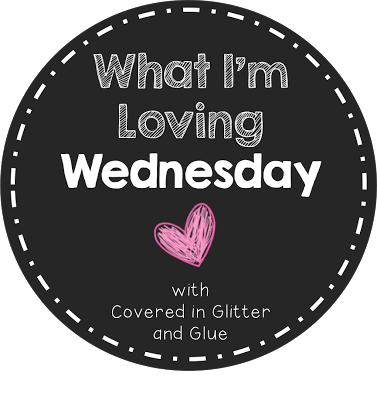 What do I love about Wednesday? Currently, I am loving some freebies and my Common Core Math mini-series!!!!! I hope that you will find these resources useful. When I am modeling and helping students discover the true meaning of the questions being asked, I often show the question starters on the SmartBoard in a whole group setting. Then, I pass out the bookmarks when the students are ready to work in small groups. I was so proud of how much my kiddos referred to the bookmarks for help this last year! To download the AT bookmarks click here! To download the AT posters click here! I hope this was helpful! 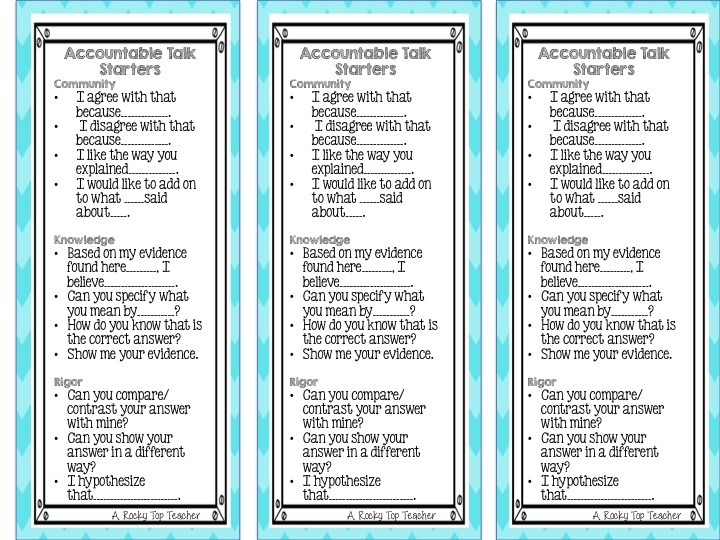 If you don't already use accountable talk in your classroom then I really encourage you to give it a go! You can always email me if you have questions or want to share about your AT experience! Sorry..I may have gone a little crazy with my backgrounds. I am experimenting for some BIG projects that I am working on! Forgive me? Up next week- Assessing vs. Advancing Questions! 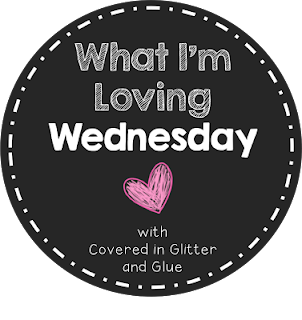 Have a wonderful Wednesday and thank you for stopping by! I love Accountable Talk! What a great way to break it down...I hadn't seen that before. Thanks for sharing! I am so glad you liked it! Thanks for reading! Thanks for the information on Accountable Talk. It is not anything new, but I have not heard the term Accountable Talk. I will definitely be looking up more information about AT. I am your newest follower as well! Hi there! 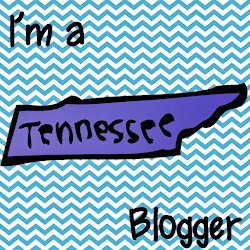 I am a fellow Rocky Top teacher (Hamblen Co in East TN) and I am trying to bust CCSS reading wide open this year but have NO IDEA how/where to even start! I downloaded and printed your cute posters and I will be downloading the bookmarks! Any and other suggestions would be most helpful! Thanks! I just realized that you are in Morristown too - DUH!! Thanks so much! Yes...I am in Hamblen CO. as well. Love our school system!